I crave seaweed. I always have. Something about the salt, the rich flavors, the bright colors and textures. My family loves it too. We put dulse flakes on popcorn (delicious! )and add it to soups and salads. We also munch on sheets of nori and use it for seaweed wraps. I even put powdered kelp in capsules for times when I need some extra energy. Harvested from the abundant depths of the ocean, sewaeeds offer a big dose of minerals, including iodine and lots of fiber. A little dried seaweed each day in food provides a simple and economical way for people to enjoy the numerous benefits Seaweed provides. Seaweed comes in quite a few different varieties, all with their own unique properties. Kelp is also known as Bull Kelp or Giant Kelp. Charles Darwin once described the Kelp beds off the coast of South America as “giant aquatic forests”. Coastal and island populations have used Kelp for food, crafting and medicine for generations. Today however, the popularity of Kelp is growing as both a gourmet food and as a possible cancer fighting substance. Japanese studies have shown that the high Iodine value in Kelp assists with healthy thyroid function, and in the 1990’s scientists isolated constituents in Kelp that have potent anti-tumor properties. The alginates in Kelp (complex polysaccharides have a soothing and cleansing effect on the digestive tract and are known to prevent the absorption of toxic metals like mercury, cadmium, plutonium and cesium. Kelp alginates are effective in treating habitual constipation and gastric bloating because they swell in intestinal juices rather than water or gastric juices and are non-irritating. Kelp’s naturally salty flavor comes from potassium rather than sodium, making it a great substitute for salty snacks. Dried Kelp fronds are delicious, and may be used in entrees, soups, salads, encapsulated, or in extract form. In addition, powdered Kelp can be added to smoothies, juices, or teas. Kombu is one of the several edible species of kelp found in Japan and is an important ingredient in Japanese cuisine used to flavor broths and stews. Kombu is a well-known dark, green, long thick sea vegetable from the Kelp family. It is used extensively as one of the three main ingredients needed to make dashi, a soup stock. Kombu is usually sold dried or in a dried shred called "Oboro kombu" but may also be eaten fresh as sashimi. Kombu may be pickled with sweet and sour flavoring and cut into small strips and eaten as a snack with green tea. Kombu can also be sprinkled and crushed into practically any dish which requires a salty taste. Wakame is seaweed that looks and tastes like a slippery spinach. Wakame can be used in the same ways as Kombu in soups and as an addition to green or fruit salads. When dried Wakame is soaked in water it expands to at least 10 times its dried size. Recent research has found that some of the fibers in Wakame help prevent colon cancer by providing antioxidants in addition to preventing the "fermentation" and oxidation of food as it passes through the large intestine. The fucoidan sugars in Wakame are antiviral against cytomegalovirus and herpes. A study published in BMC Complementary and Alternative Medicine reported that taking an extract of Wakame prevented and reduced the severity of recurrent herpes outbreaks. Daily consumption of small amounts of the reconstituted seaweed (a tablespoon of reconstituted seaweed prepared by soaking one-quarter teaspoon of dried seaweed) may lower blood pressure. The Japanese Journal of Cancer Research reports preliminary findings that daily consumption of small amounts of Wakame may be more beneficial in treating certain kinds of breast cancer in women than chemotherapy. The extract made from Wakame has most recently been touted as a breakthrough in weight loss, specifically targeting abdominal fat accumulation. Nori or Porphyra is red seaweed that grows off the coast of Japan. One of the oldest descriptions about Nori is dated to the 8th century in the Utsubo Story written around 987 where it was recognized as a common food. In Wales and other parts of Europe Nori is called laver. Nori is perhaps best known in the U.S. as a wrap for sushi but it has a long history of use in traditional Chinese Medicine (TCM). It is used to promote healthy circulation, combat thyroid problems, treat soft swellings such as goiters and lung conditions, kidney disease, fatty cysts, painful urination, hypertension, nervous disorders, edema, warts, and indigestion. Much of the beneficial effect comes from its diuretic effect and from high mineral and iodine content. In addition, Nori may help the body break down fatty foods, and it has some antibiotic properties. Like all seaweed, Nori is excellent for Vegans as it provides up to ten times more calcium and iron by weight than milk. It is easy to incorporate into culinary items, and it may be added to soups, salads, entrees, or sushi. Dulse is red seaweed harvested in the cool waters along the Atlantic coast of Canada and along the shores of Ireland and Norway. Its fronds grow in tidal areas on rocks, shells, and on larger seaweeds. Dulse is a good source of minerals and vitamins compared with other vegetables and it contains all trace elements needed for proper growth, development, and physiology. In several traditions of European herbal medicine, Dulse was used to remove parasites, to relieve constipation, and as a treatment for scurvy. It is a superior source of phytochemicals the body needs to make thyroid hormones that affect weight and metabolic rate. Dulse is a gentle alternative to Psyllium or Senna for the treatment of constipation. There are many culinary uses for Dulse. Sun-dried, it can be eaten as is or ground to flakes or powder. It can also be pan fried quickly (garlic butter optional) into tasty chips, baked in the oven covered with cheese then add salsa, or microwaved briefly for a crispy treat. 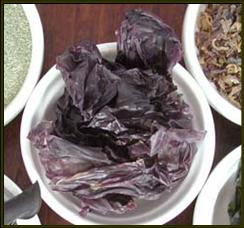 Dulse can also be used in soups, chowders, sandwiches and salads, or added to bread/pizza dough. To get the benefits of Dulse it can also be used in tea, encapsulated, or tinctured. Bladderwrack is seaweed found on the coasts of the North Sea, the western Baltic Sea, and the Atlantic and Pacific Oceans It was the original source of iodine, discovered in the early 1800’s, and was used extensively to treat goiter. In the 1860s, it was claimed that Bladderwrack could counter obesity by increasing the metabolic rate. Recently, it has been featured in numerous weight-loss remedies. A common food in Japan, Bladderwrack is used as an additive and flavoring in various food products. Bladderwrack is commonly found as a component of kelp tablets or powders used as nutritional supplements in connection with constipation, diarrhea, gastritis, gastro esophageal reflux disease (GERD), heartburn, hypothyroidism, indigestion, iodine deficiency, wound healing (topical). Modern research reveals Bladderwrack can be an alternative to soy in supporting women's health. A study published in BMC Complementary and Alternative Medicine in 2004 reported that women who consume Bladderwrack can experience normalization of short menstrual cycles and relief from severe PMS. Irish Moss is a tough, stringy red, yellow, or purple seaweed growing up to 6 inches (250 mm) high on rocks in tidal pools along the northern Atlantic. It is harvested at low tide and dried in the sun to make carrageenans, a thickening agent for jellies, puddings, and soups. As a traditional herbal remedy in Ireland, the powder is appropriate for making herbal combinations for coughs and colds, but the whole plant is best for treating indigestion and constipation. Like many of the other seaweeds, Irish Moss is used as a filler, stabilizer and emulsifier in pharmaceuticals, cosmetics and a wide array of body care products. excerpted from Healing Wise, A Wise Woman's Herbal by Susun Weed. Ingredients: 3 onions, chopped, 3 tablespoons olive oil, 6 potatoes, cubed, 2 carrots sliced, 2 parsnips, 1 cup sliced dried or fresh wild greens, 1 cup dried seaweed of your choice, 12 cups pure water. Method of Preparation: Saute onions in oil until brown. Add all the remaining ingredients and cook until vegetables are done. Adjust seasonings adding sea salt as needed and let mellow overnight or serve immediately. Ingredients: 1 cup dried hijiki, 1 cup warm water, 2 tablespoons olive oil, 2 onions crescent cut, 2 carrots diagonal cut, 1 tablespoon tamari. Method of Preparation: Soak hijiki in water about 20 to 30 minutes. Cut onions in half from top to bottom, then cut into slices. Cook onions in oil until very brown. Put the carrots in an even layer over the onions. Top with a layer of hijiki. Add tamari and about half of the soaking water and cover pan tightly. Cook until the carrots are tender. What's your favorite way to enjoy seaweed? Share your favorite seaweed recipe with us! This is a great post. I mostly use kombu, dulse and hijiki. My young daughter loves nori, and that makes me happy. We both feel great when we eat seaweeds. Thanks for stopping by. I love hijiki too! I added some recipes to original post - I've tried them all and they are yummy!